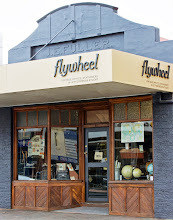 The Drill Hall Emporium: Garagistes, new wine bar in Hobart serving amazing food! Garagistes, new wine bar in Hobart serving amazing food! Garagistes is a newly opened wine bar and restaurant serving very exciting food in Hobart. I was fortunate enough to dine there recently (and plan to go again this week!). The wine list is 46 pages long and includes carefully selected wines from all around the world. 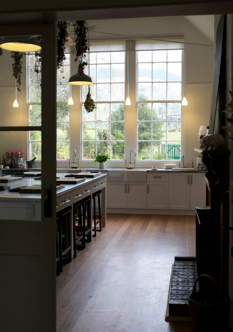 The food is based upon local fresh Tasmanian produce and brought together by head chef and part-owner Luke Burgess. Above shows the industrial style interior that has a very organic feel to it - partly from the large wooden tables but also from the gorgeous hand-made pottery plates and dishes that the food is served upon. It was formerly a garage. The conversion is great, I especially love the open kitchen (see bottom image). We started with the salt cod fritters with celeriac leaf mayonnaise - I can't wait to have more of these. (Image from http://www.foodtourist.com/). And we ended with the lardy cake teamed with a malt chiffon and condensed milk - yum. (Image from http://www.foodtourist.com). Of course, there were 3 or 4 more savoury dishes in between there that we all shared (sorry, I didn't take any photos). And I loved them all! Luke Burgess in action in the open kitchen (above, right). For a sample menu go to http://www.garagistes.com.au/. I have heard about it somewhere recently. It looks pretty inertesting. Where is it in Hobart? Hi Sarah, Garagistes is in Murray St, Hobart. They have a sample menu and wine list on their website http://www.garagistes.com.au/. No bookings (except Sunday lunch) just turn up and hope for a seat! Go now before they feature in Gourmet Traveller and are packed out (although I think word has already got out, the night we went was very busy). But it is a good excuse to wait at their lovely bar for a table and have a glass of nice wine! Yummy!! Love a fabulous place to sit, drink, chat and eat. Have wandered by but have not been in yet. Thanks for the tip will add it to my "to list" list for next week. Taking some time to rest this week.